In recent years, criminal fines and penalties have risen drastically as a result of price-fixing and bid-rigging conspiracies uncovered among automotive parts manufacturers. While companies face these mounting fines, they need not accept the fine initially imposed. The United States Sentencing Guidelines do allow for a reduction of a criminal fine based on a company’s inability to pay. 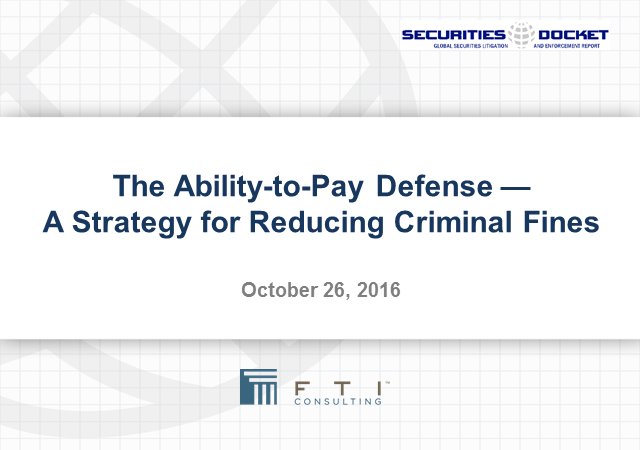 This webcast seeks to inform practitioners on the considerations of this ability-to-pay defense, strategies and process. As an illustration, this webcast includes a case study analyzing a company’s ability to pay a fine resulting from antitrust violations; however, the described methodology has other applications. Additional arenas where this defense has relevance include environmental clean-up costs, healthcare fraud, securities and commodities fraud, as well as FCPA and sanctions violations. The session will provide insight into the financial analyst’s role in evaluating the company’s financial status and the basis of the framework for the ability-to-pay argument. As part of the case study, the session will walk through an ability-to-pay model including analysis of projected free cash flow and the strength of the company’s balance sheet. Lastly, the session will address the importance of the financial expert’s role in discussions with the DOJ and its financial expert.